How to check if send Gmail message is read or not? There are lot of Gmail users around the world. When you send an important Gmail message to your colleagues, subordinates or others via your Gmail account, you don’t know how to check if send Gmail message is read or not by the receiver. When you send any Gmail message to someone via your account you will get a send notification on your screen. But that message is shown your message is send properly. But sometime most of the person complain that they does not received your email account. If you send email message from your Gmail account to someone many time but he complain again and again regarding not receiving the mail. You have to face this problem lot of time and you will be blamed without your fault. In that situation you must need to know how to check if send Gmail message is read or not? You must have to add an extension to your Gmail account which helps you to properly check if send Gmail messages is read or not by the receiver. You just have to take few simple given steps which helps you to easily overcome that type of problem. Step 1: Open your Google Chrome or other web browser and type “mailtrack” keyword in the search box. You will get lot of option. You must have to click on the first choice or open mailtrack website. Step 2: Click on the “Install Mailtrack” button. 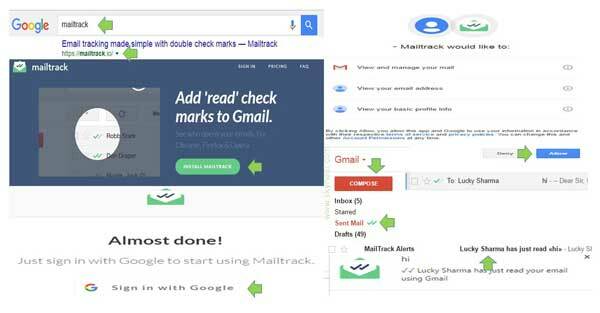 Now “Mailtrack for Gmail” extension is add on your web browser. Step 3: Sign in your Gmail account and click on the “Allow” button. Compose a new email and send to someone now, you will see check mark on the “Send Mail” group. When received email is read by the receiver you will get double tick mark symbol on your Send Mail. You have to also get an confirmation message on your email account regarding your mail to read by the receiver. Now, after reading this guide you can easily check if send Gmail message is read or not by the receiver. Now, If any person complain you regarding not receiving the mail or not read your message then you can prove them. If you have any suggestion or query regarding this guide then please write any your suggestion from comment box. Thanks to all. It is Helpful article for us. Thanks for writing …. keep in touch for latest upcoming articles.